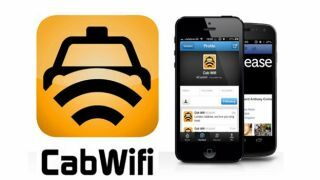 London's iconic black cabs are to be turned into Wi-Fi hotspots thanks to a new initiative from a Tech City start-up. The EyeTease company has reached an agreement with Transport for London to ensure on-the-go 'CabWifi' connectivity will be rolled out in the early part of next year. As a result, passengers will be able to enjoy free wireless internet for 15 minutes, which according to EyeTease is the average time most folks spend in a taxi in the Big Smoke. For every 15 minutes travelling (or stuck at a light), surfers will only have to watch one 15 second advert, while cabbies will also get a separate login for personal use. The hotspot will automatically switch between pulling in 3G and 4G data, while users will see the network pop up within the available options in their Wi-Fi settings. The latest connected London initiative follows a host of new Wi-Fi options for visitors to the city, rolled out in time for the London 2012 games. Thanks to Virgin Media, 72 London Underground stations now boast free Wi-Fi and will continue to do so thanks to partnerships with rival networks like Vodafone and EE. BT now has half a million hotspots in the city, while O2 offers free Wi-Fi on some of the Capital's busiest streets.